April 17, 2010, we predicted the impending catastrophe to be unleashed after the Icelandic volcano Eyjafjallajokull erupted and predicted that the Katla range would follow suit, as it has done every time in the recorded history of volcanic activity in Iceland over the last thousand years. “Eyjafjallajo”kull. While some say it is “unpronounceable”, it would be a good idea to get used to the name because for sure it is going to be around the international media for a long time to come. Eyjafjallajo”kull is threatening to become an ecological catastrophe. Eyjafjallajo”kull is dangerous, it is toxic, is poses a serious health threat and it has always been a precursor of worse disasters to come”. “Eyjafjallajo”kull (ei-zha-fiAla-jo-kUtl). Island-Mountains Glacier. It’s done it before and it wasn’t pretty. It erupted in 920, 1612, 1821-1823 and now in 2010. All of the previous eruptions were precursors to more massive activity from the neighbouring Katla volcano, which this time, according to geologists, could take one to two years to erupt. And Eyjafjallajo”kull is the dwarf, Katla the giant”. Belarus, Croatia, France, Italy, Lithuania, Norway, Serbia, Spain, Bulgaria, Greece and Turkey have severe restrictions, some almost total), let us imagine what can happen if this goes on for a couple of months. Or if the wind changes and blows it south-west across Canada and the USA. Then what happens when Katla blows?” Eyjafjallajokull: Impending Catastrophe? Bardarbunga is located to the north of the Katla range. And it is showing alarming signs. According to research by Terrence Aym. 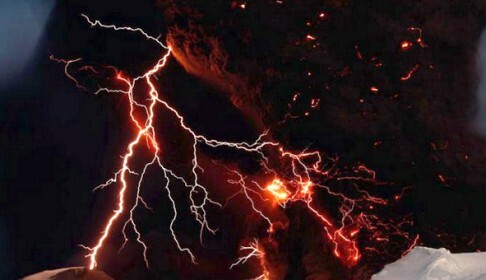 “Worried experts warn that this eruption could be much, much worse. University of Iceland geophysicists have warned of a significant rise in seismic activity in the area of Vatnajo”kull, the largest of Iceland’s glaciers.